Due to domestic duties, a day long float fishing session on the Thames at Home Park, Windsor, had to be reduced down to a few hours in the afternoon this week. 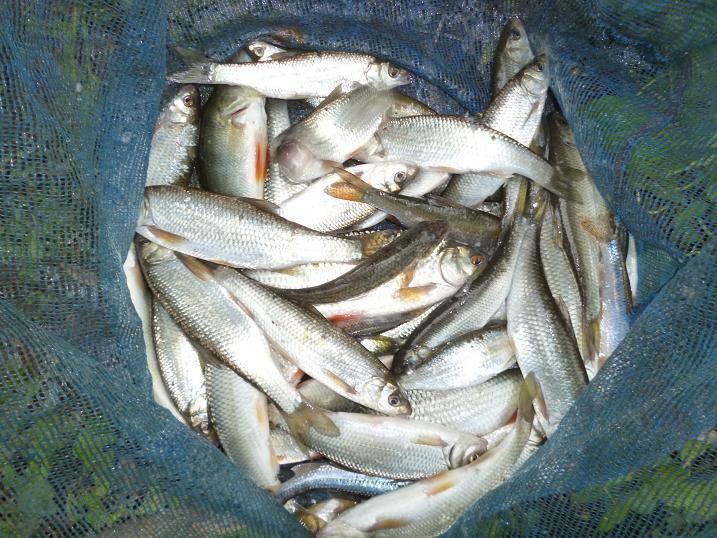 A team match on Sunday had produced double figure bags of roach and dace from swims spread along the length of Old Windsor AC’s day ticket water and armed with the winning peg numbers, looked forward to a full net. My morning did not go to plan and driving out of my way to get some maggots for bait, meant that it was almost 1 pm, by the time I reached the river. 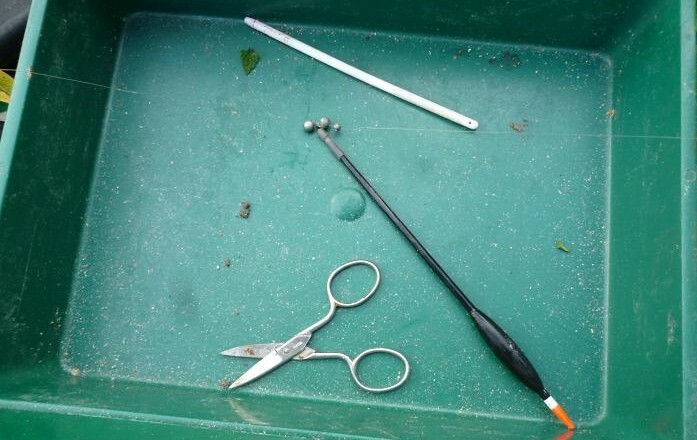 Peg 5 was the nearest banker swim, having produced over 14 lb of roach and dace in the five hour match and and set up my 14 ft float rod with a 6 BB Avon float only to find on plumbing the depth, that the shelf extended well beyond stick float range and a waggler, bottom end only float was needed. Having spent ten minutes setting up the Avon rig, I decided to try this bottom only, cutting off the top rubber and locking the bottom with two AA shot, while changing the drop shots to suit a waggler pattern. Finding the bottom leveled out at about ten feet deep, three rod lengths from the bank, I began catapulting maggots and hemp upstream to cover the area. The float cast well and sat upright, shotted down to the orange tip, the bait just tipping the bottom, the first bite holding down and being unmissable, hitting into a good dace, but losing it in my enthusiasm to bring it up from the depths, the size 16 hook pulling out. A spray of maggots and the float sank again, another dace juddering away to the surface, this time staying on. I settled into a rhythm, cast, spray maggots, pick up rod and strike, the float usually going under directly out in front of me each time, reeling in slowly to bring the dace to the surface. Number ten was just visible, when the green flash of a pike burst the bubble, as it grabbed the dace, diving deep and turning downstream toward an overhanging willow. My curse had struck again and I kept pressure on, trying to steer the pike clear of the tree. 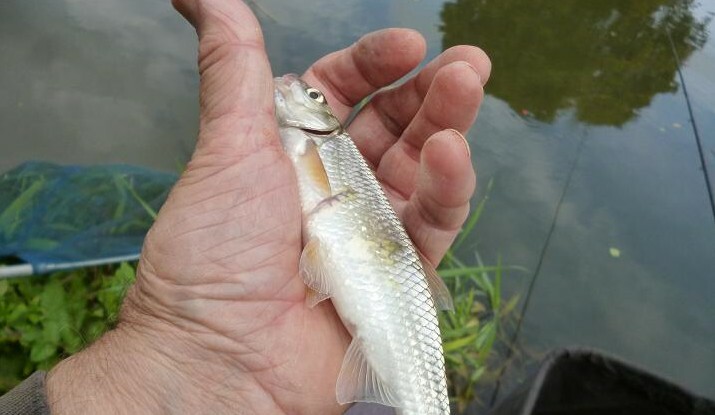 I could see it was only about 3 lb, holding the unfortunate dace across the middle, as it swam back out across the river, before letting go. Not too damaged, the dace swam off without a second look, but the damage had been done to the swim and had just started catching again, when a massive barge came charging down from the lock, close to my bank, pushing a bow wave ahead of it and sucking everything behind it, including my keep net, which was dragged one way, then the next. Cursing that the barge had been so close, the reason for it came chugging upstream, an equally large barge. Like two juggernauts passing on a narrow road, it must have been a hairy moment for those on board the two vessels. My swim was now stirred up and any fish scattered. Nothing for it, but to start again, laying a base of hemp on the line and feeding at intervals. 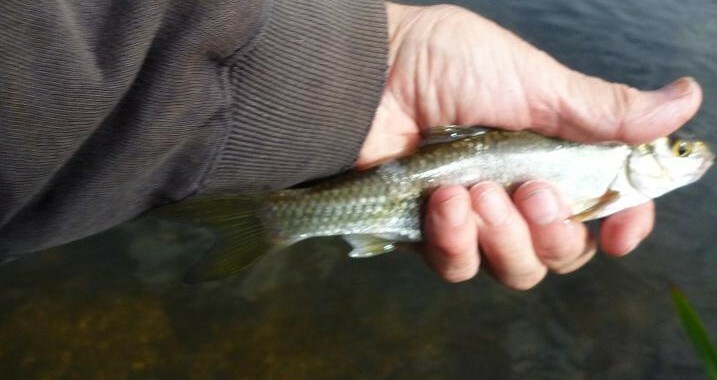 A couple more dace, then missed unmissable bites, with smashed maggots. The fish had come up in the water chasing the bait and I shallowed up by two feet, hitting a fish first cast, the tap-tap bounce on the rod top telling me it was a decent roach, the landing net coming out for the first time. 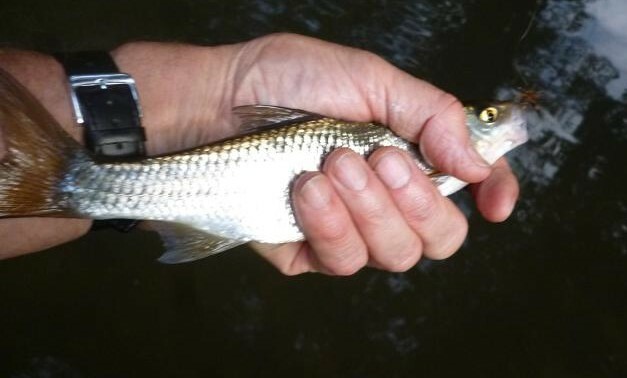 Showing signs of at least one visit to a keepnet, this was the start of a roach, or dace a chuck, the float going under upstream of me now, often before I’d picked up the rod, after each feed with the catapult, the fish hooked deep in the mouth, feeding with confidence. Wop! The pike had struck again, this time a roach was seized and was sure a bigger pike had taken it, hugging the bottom, bending my rod right over, surging upstream, then turning to sulk on the bottom, probably to turn the roach before swallowing it. I pulled for a break, not wanting to waste time trying to land what was now an immovable object, only for it to begin a slow drift downstream toward the willow. The line sang with the tension, but with 5 lb main line and 3 lb hook link, all I could do was backwind to avoid breaking my rod. Then it was over. The hook link had been cut on one of the razor sharp teeth, only six inches remaining. This was not going anywhere to plan. Tying on another hook link, the sound of an amplified voice warned of the next obstacle to come. Two speed boats accompanying a pair of rowing eights, full of young novice rowers from the Eton College boathouse, just upstream of the bridge, came drifting down towards my swim, their tutors and coxes calling out instructions, thrashing their oars through the water in front of me. I endured this for the next 20 minutes, barely able to cast, or feed, just in cast they thought that there was bad intention, when firing maggots in their direction. Eton College own most of the land bordering the Thames at Windsor, although the bit I was on is owned by the Queen. The bites had stopped and I increased the depth again, fishing closer to my bank, now getting a gudgeon a cast, plus the odd perch, losing a pound plus stripey at the net, when it shook the hook out. The Eton College clock had long struck 3 pm and decided to go for broke, firing out my maggots until they were gone, the bites now telling me that bleak had moved in, the float bobbing and lifting, these shiny silver fish taking on the drop. Every now and then the float would sink out of sight and a dace, or roach would come swinging to hand, but with bleak making the running, I was happy to put the rod down, when the chimes rang out 4 pm. It had been a testing few hours, but the sound of churning fish, as I lifted out my net was a fair reward, my digital scales showing 2.7 kg, translated to 6 lb in old money, not bad for under three hours fishing. I could not help having a “What if” moment looking at this bag. More time and bait, no pike, or boats, that’s the trouble with anglers; never satisfied. Trout river saves best till last. Due to the last visit to my syndicate water being cut short by foraging ruminants, I was keen to return the next day, but then it rained. Not just a shower, or two, but real rain, for days. At last some pace on the river, with a bit of colour to it. With a busy week, I was only able to slot in a couple of hours after an early dinner, the sun already low in the sky at 6 pm. Once bitten, twice shy, I gave the farm fishery a miss and parked at the lower end, where my only company would be the less attentive sheep. With little time to spare, I hurried down to the main feature of this section, an S bend, where a deep pool has formed,which gives way to a fast, shallow run at it’s tail. There was a gentle upstream wind, ideal for the dry fly and worked the Dry Sedge up the pool, the flow just right, giving minimal drag to the fly. OK, there were no rises, flies lifting off, or Daddies skating across the smooth surface, but a fish can often be tempted up to take and enjoyed ten minutes watching the line unfurl from the cast, the fly dropping with the merest dimple, anticipating a casual interception each time. Nothing. At this stage, I was convinced that there were no fish in front of me. I could see the gravel, where the tail rushed over the shallows, so any fish should have seen the fly, while I was far enough below that, to be out of their sight. Time to get out the box of nymphs, a size 14 Flash Back Gold Head Hares Ear falling to hand. The Flash Back nymphs work well in coloured conditions and my choice was borne out, when a bulge appeared beneath the surface, as the line drifted back toward the shallows. 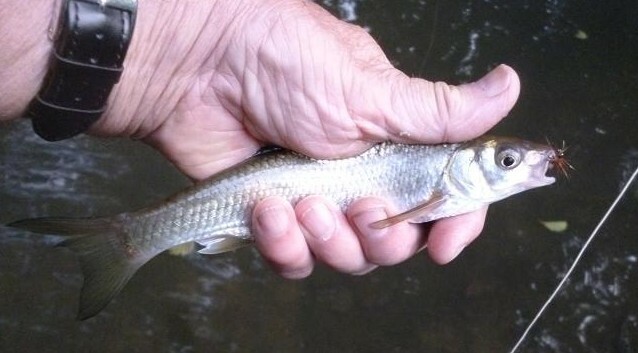 A sharp lift of the rod set the hook into a good dace, which tumbled across the surface, before being swept downstream into the fast water, soon to be skating on it’s side to the net. My next cast must have landed right on the nose of another fish, which took on the surface the instant the nymph landed. I missed the take, a decent size whatever it was. 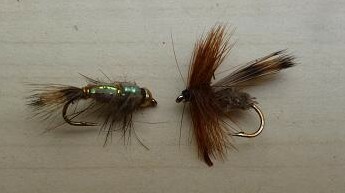 What a contrast, from nothing on the dry, to all action with the nymph. Tugs, swirls, fast stike, or slow, I missed them all. Probably a shoal of dace in this fast water down the middle. I cast far up into the pool over the deep, slow bend. Halfway back, the leader disappeared into a tunnel, I lifted and felt the dull kick of a good fish, an instant later seeing the full shape of a large trout, as it launched vertically clear, it’s rudder like tail skimming the surface, before it crashed back in. I was as surprised as the trout, watching it spiral round the pool, leaping again, before heading upstream taking line. I followed, then realised that my landing net was still on the bank below the shallows. Giving more line, I backtracked, scooping up the net in my free hand, promptly slipping over in the muddy wheel tracks of a tractor, where it had crossed the shallows. I did not deserve this trout, which was still busy trying to escape upstream, but managed to keep the rod high, scrambling to my feet, bringing my emotions and beating heart under control. The fight was now on my terms and I countered every run, it’s final burst taking it over the lip of the tail, but it was on the surface and the force of the current pushed it closer to my outstretched net, a boot full of water worth the sight of a fin perfect wild brown trout. What a beautifully marked fish, it’s big jaw a sign of spawning duties to come. After such a battle, there is always a reluctance to return the fish immediately, just wishing to admire it’s perfection, but after a quick photo session, I held it facing upstream in the edge, until it pulled free of my grip to swim back to the pool. I had no desire to fish after this and anyway clouds had moved over the sun, bringing twilight suddenly. I had a long trek back to the road, a gate and a fence to climb; it was time to go, probably being my last session on the river before the season ends. 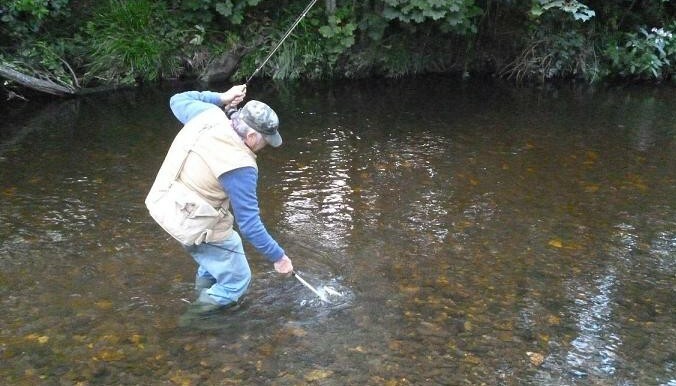 Trout stream sport against the odds. On my return from the Isle of Man, with it’s rivers packed with healthy wild trout, signs of continued heavy rain while I was away, drew me back to my small syndicate chalk stream, where I hoped for a redeeming few hours fly fishing, before the end of the season. I should have known better. Running through arable land for most of it’s course, nitrates and abstraction from farm boreholes have done their worst this season, the lack of flow has resulted in hard packed gravel beds festooned with furry sludge. Walking down river from the road, I could hear only the barest trickle of water over the stones and on rounding a bend found that the farmer had been busy cutting trees again. 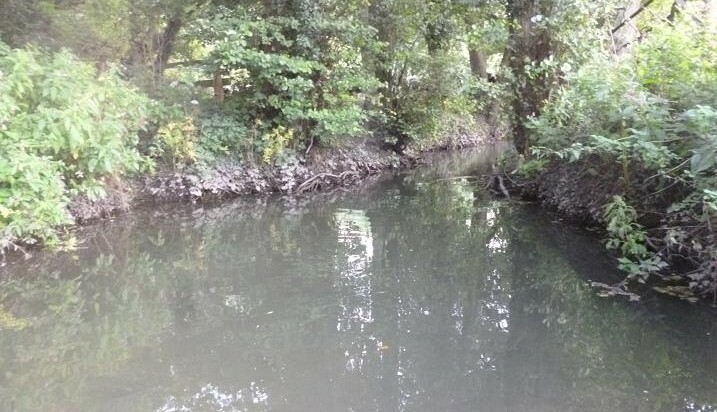 This time it was a stand of mature oaks lining both river banks, a tunnel of trees that had kept trout safe from herons and cormorants, while providing challenging sport, were now gone, reduced to saleable logs. The reason? Fear that they would blow down onto his barn. We have the fishing rights, but they have to give way to the working farm. I had intended a few casts at the cattle drink, but the field opposite was full of bored bullocks, which looked my way as I approached, some following along the bank and decided to push on down past a stile before fishing, but the sight of a rise in the next pool down stopped me in my tracks. Before I had reached the tail of the tree lined pool, the fish had risen again and I pressed myself against a tree, making a side cast to the spot with a dry sedge. Up it came and the rod bent into a fat young brown, which raced round the pool, before coming to the net. As I climbed the stile, I could see fish rising in the pool below, which is protected by high banks and a tree canopy, the only approach being from the river and walked down looking for an entry point, finding water shallow enough for my wellies, where I’d needed waders earlier in the season. Wading up toward the deep pool, I responded to a rise beneath an overhanging branch, setting the barbless hook into a six inch brown. A depressing start to the evening, was already baring fruit, catching on the dry fly is always a pleasure, whatever the size of fish. 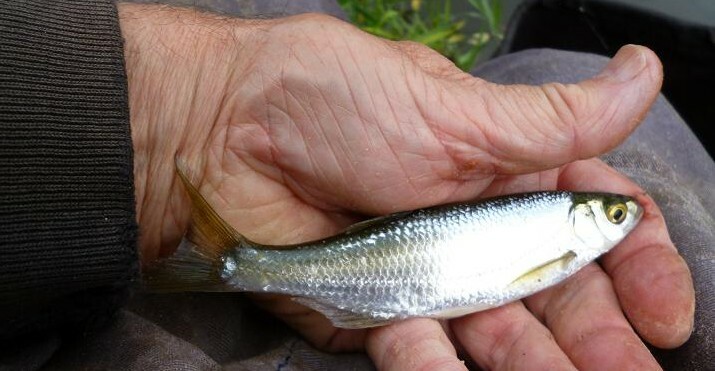 Within casting range of the rises, I missed the first two offers, but the third resulted in a shower of spray and a deep fighting fish, that dived back into the pool, not a trout this time, an equally hard fighting dace. 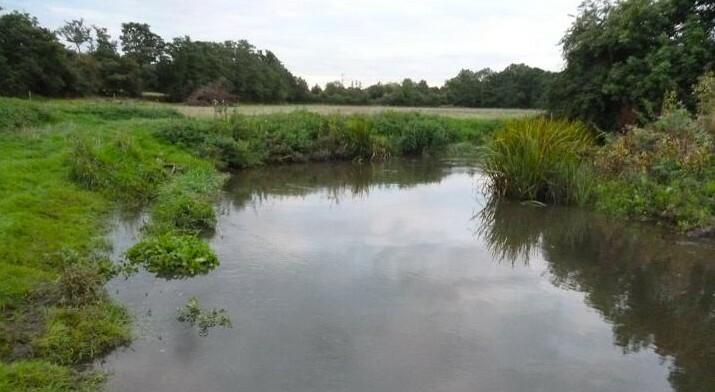 The river is full of dace this year, where trout aught to lie, this pool having provided some of my best fish over the years, it having been named Dead Cert by previous members for it’s reliability. I continued to fish and the dace obliged, hoping that a decent brown would get to the fly first, but dace like these are still worth catching. The cattle had now followed me across the river at the cattle drink and the river changed colour, halting the rises. The bullocks were now crowding the stile and decided that retreat was the safe option, continuing downstream to a bridge, before making my way upstream again. The cattle had decided to cross back, muddying the river again. I’d had some good sport and resolved to return before the end of the season. 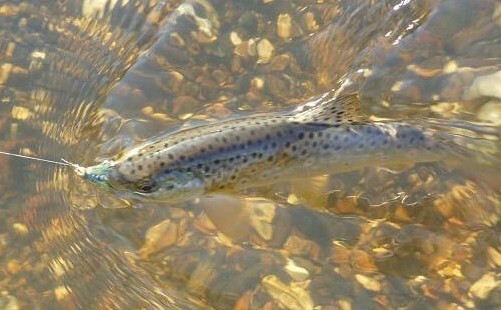 Known worldwide as the home of the TT motorcycle races, the Isle of Man can boast excellent game fishing too, with runs of salmon and sea trout up it’s short rocky rivers and well stocked reservoirs, while the resident brown trout will provide sport on light tackle at any time of the day. 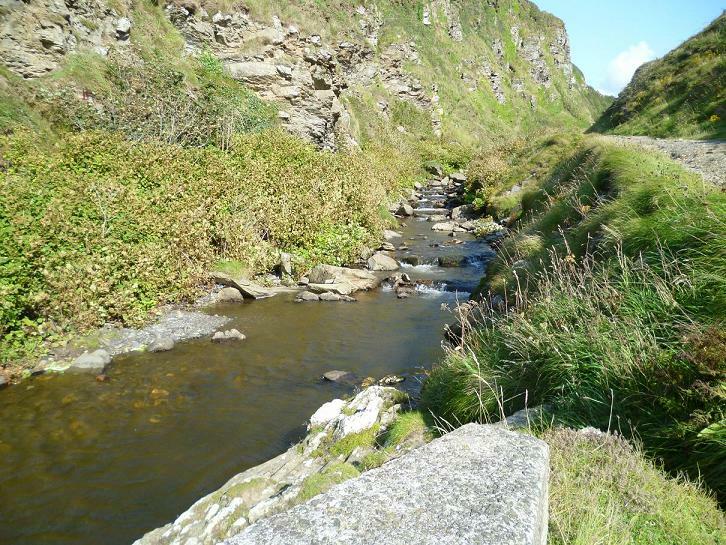 The bonus of trout fishing on the Isle of Man is the scenery encountered along the way, finding out of the way gems missed by most visitors, this being the river Neb a mile above the estuary. A trout can be seen rising on the right of the arch. These trout have to be some of the most distinctly marked browns, that I have caught, this one taking a dry sedge on the river Neb. 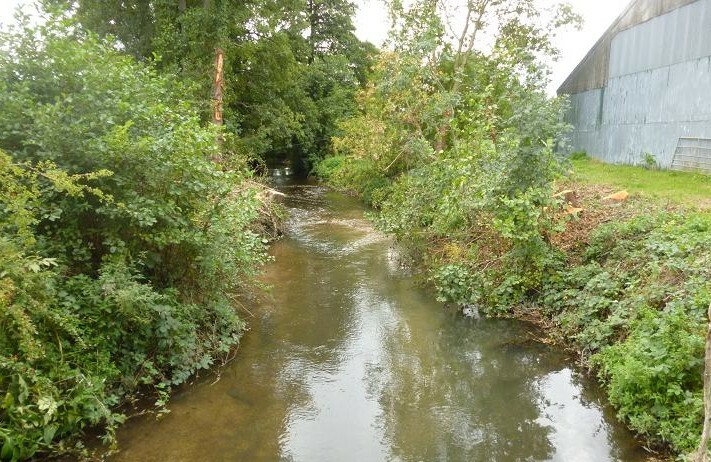 Unlike the mainland, there are no riparian fishing rights, all rivers are controlled by the I o M government, a weekly £27 river license allows fishing in all the rivers, where you can gain access to the water. 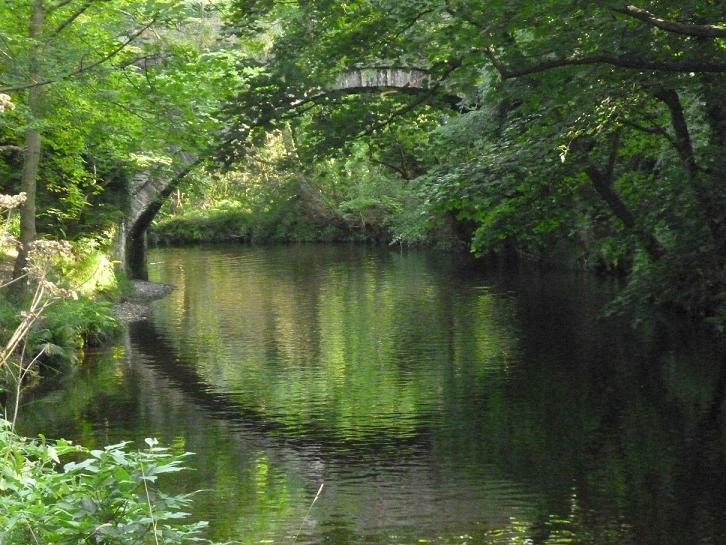 National Glens and Government owned lands also give access to miles of fishing. One of many browns netted from the Neb at the Raggatt, an overgrown wasteland, when I first visited, but recently transformed into a park with managed banks, having seating for anglers and walkers, but also the ideal spot for ball chasing dogs, their owners seemingly unaware of the needs of anglers. Another example of the Neb trout, well rounded and full of fight. I watched a brown twice this size cruise up along side my fly, give it nudge with it’s nose, then slowly sink back to the depths. Must try harder next time. A pool on the Foxdale river, in the parkland grounds of the DEFA offices at St Johns, where I bought my license, which was home to several above average browns, all taking the dry sedge fished upstream. The best came from a deep tree shrouded pool, that only allowed a bow and arrow cast into the back eddy formed by a waterfall, watching a dark shape rise out of the depths, turn over and take the fly, then running off downstream beneath overhanging branches. I could only fight the fish with my rod tip held under the raging waterfall, reeling it back, until ready to pull into the net. 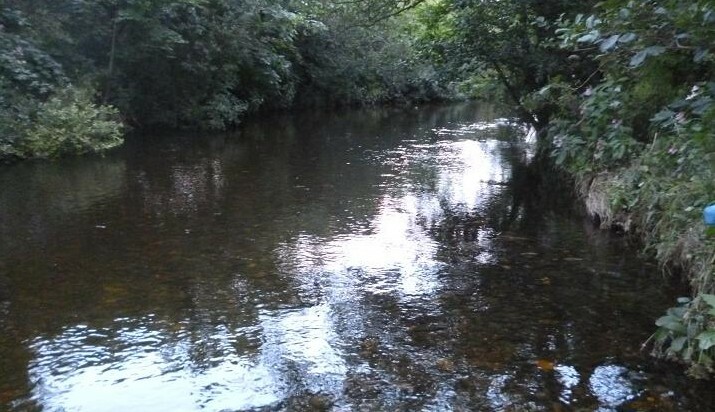 This was just a taster of the river fishing in the Isle of Man, these waters all with in walking distance of my accommodation, a ten mile drive will put you on the Sulby river near Ramsey, or the Dhoo near Douglas, while many smaller rivers, like in Glen Maye below, will give plenty of sport. Visiting the Isle of Man for the Manx Grand Prix motorcycle races, my fly fishing gear was a priority addition to the holiday packing, this hilly principality jutting from the Irish Sea, able to provide excellent sport to the angler prepared to search out the deeper pools of the rivers flowing out of it’s many wooded glens. The ferry had left the English mainland in bright sunshine, but as the Island came into view, it was shrouded in dark clouds and on docking in Douglas at 6 pm, headlights were needed to light the way along the narrow rain drenched roads to Peel. The following day dawned bright and clear, but a walk to the nearby river Neb, showed that it was in spate, full of dark brown peat water, washed down from the hillsides high above Glen Helen. There would be no fishing today, or the next, but two dry days saw the river back to a steady pace and according to a Manxman met on the bank, it was full of sea trout and salmon, fresh run from the sea. I’d only come equipped with my trout gear, expecting to catch small brown trout on my 7 ft rod, but the chance of a sea trout got me to the bank, just as the sun was setting. Sea trout will usually lay dormant in deep water during daylight, dropping back into shallower runs, as the light fades, the early ours of darkness, or just before dawn, being the most active. Making up a leader with an 8 lb point, I searched through my trout flies for a suitable candidate, initially settling on a traditional sea trout fly, a silver and blue Peter Ross, but it looked insignificant against a modern reservoir standby, a Blue Flash Damsel, with it’s gold head, flashy blue tinsel and long tail. The BFD was tied on, but the weighty head made for a looping cast on the short rod and I battled with a gusting upstream wind, blowing from the Irish Sea only two miles away. Plenty of small trout were rising, some jumping clear of the water and was tempted to try an upstream dry Sedge, before the sun disappeared behind the trees, but persevered, casting down and across, getting the occasional pluck, as these small fish pecked at the tail. A swirl and a solid pull got my heart racing for a moment, lifting the rod into a high flying brown of about six ounces, that cartwheeled across the surface, before fighting hard with the flow of the river. Not my target fish, but as it would turn out, the biggest brown of my visit. Fishing with worms and spinners are legal trout fishing methods in the Isle of Man and I would think the preferred method of many locals for migratory fish, these banned on most mainland rivers, while fishing any fly downstream is also not permitted on the chalk streams of the South of England, a Blue Flash Damsel also a definite no no. It would have been easy to pack my waders, but had only packed wellies, mainly in case of a rainy visit, which restricted access to many of the pools, tending to fish in gaps between trees and gorse bushes. The light was going fast and I’d had a few near misses among the branches, but skill, or luck kept me clear of the greenery. A large fish had jumped 30 yards downstream and I was on edge, ready for a take, when one came, but again a hard fighting brownie was the result, good sport on light tackle, this plump fish was returned with the minimum of fuss, due to the pinched down barb of the lure. Under the trees it was now getting difficult to judge my casts and walked back down to the large open pool, where I’d begun the evening. Here the light was better and a safe backcast allowed me to explore a deep run below the trees along the opposite bank, swinging the lure across into shallower water. The river was alive with the movement of fish, sea trout were disturbing the resident browns, causing them to leap clear, while there were constant swirls and splashes from these larger fish. A hump raised up behind my lure, as I retrieved it upstream, not taking, but swirling away, when I lifted off. My anticipation was on full alert, following a series of fierce plucks and recast to cover the same area, when it all went solid. Milliseconds later, the surface erupted with a head shaking boil and a tail slapping jump, as the bar of silver zoomed across to the deeper water, swimming at full tilt upstream, line spilling from my reel, as it went by, my tiny rod bent double in response. I followed it upstream for ten yards, laying the rod over to avoid overhanging branches, the sea trout easing off the pressure, but still pulling hard against the flow of the river. It turned and came back down, with me stripping line, desperate to stay in contact, aware of the barbless hook, shorter straight line runs, giving way to head shaking. 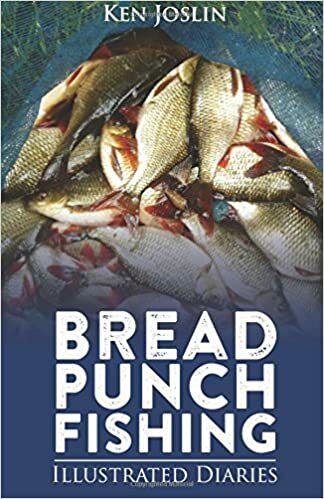 I got back in the river, the shallows engulfing my boots, as I guided the streamlined fish towards my net, lifting it out in triumph, only for the lightweight net to collapse, when one of it’s arms pulled out, dumping the fish unceremoniously onto the bank. Not the best picture in the world, but the best of a bad bunch in the low light conditions. At 16 inches long, this would have made a fine meal, but these fish do not come my way very often and I was happy to return it to the river. I just hope it made it to the spawning grounds, avoiding the worms and spinners of the locals.